I laugh when I hear that people are afraid to try Fugu which is a fish known to be highly poisonous. Of course eating Fugu in an irresponsible way could lead to significant damage to your internal organs and or cause immediate and sudden death. In southern Japan, in Kyushu there are places known, where people can actually taste the poisonous liver of the Fugu. When I have heard about this, I did hear of one particular story that raises the hair on my back. Before telling you this story it is most uncommon and often when chefs claim to be serving the liver of Fugu, it is actually a substitute to avoid any kind of terrible poisoning, and the loss of your business and of course your license. A friend of mine went to a town called Oita, where it is possible, or it is believed to be possible to taste the Fugu’s liver. After digesting the milky liver, he went back to his hotel and lay down. He could not move even to call for assistance on the telephone, which was located directly beside where he was resting. He said his entire mouth and tongue was paralyzed and he was having difficulty breathing. Actually he waited it out and was lucky to survive given that he had a very mild case of fugu poisoning. Pictured below is the white meat of the fish prepared sashimi style where it is found out and presented in a very typical manner. In order to understand Fugu and the raw meat of the fish, you must begin to understand texture and taste, something that is not so common in the west. 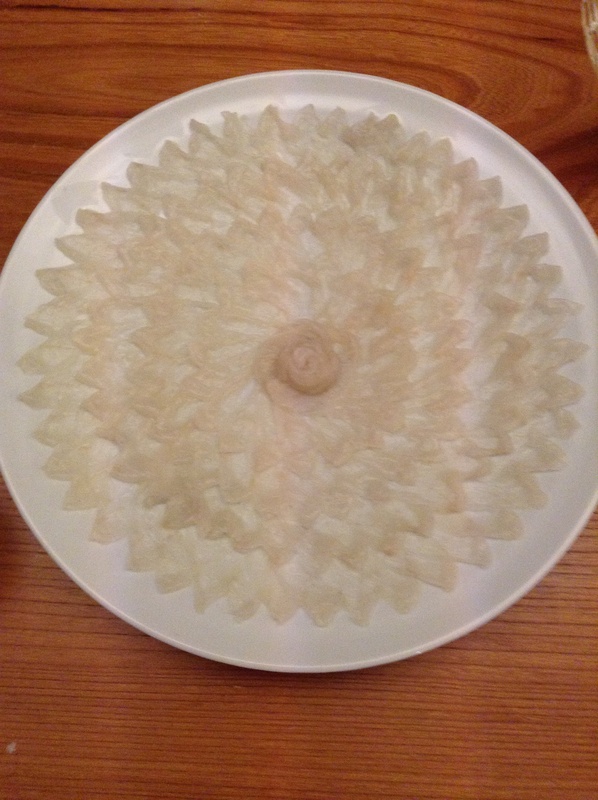 I talked about this in past posts but I will not get into detail here: in the future I will post on Fugu as the season starts to become more ripe and I begin to taste fugu.